Wiener Dog Nationals :: Movie Information :: RabbitTV GO! A little boy (Julian Feder) and his family adopt a runt of a dachshund from a shelter and name her "Shelly," in honor of shelter dogs everywhere. Despite all odds, the dog surprises the boy's father (Jason London) when it places in the state trials of the illustrious Wiener Dog Nationals Race. The family pulls all of its resources to advance to the next round only to face strong opposition from the reigning champion dog, Princess and her owner Ms. Merryweather (Morgan Fairchild). Meanwhile, Melanie (Alicia Witt), one of the racing judges, is banned from the races by the head Judge (Bryan Batt) when she tries to help the family prove that Ms. Merryweather is cheating. 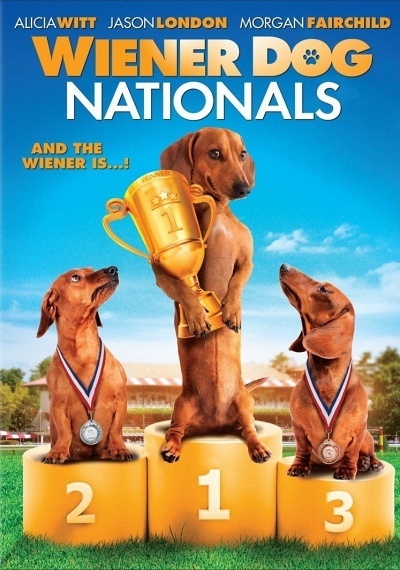 Relying only on the dog's skill and her young owner's passion for the race, little Shelly and her new family must face the challenge of advancing through the cut throat world of the nation's greatest wiener dog race, Wienerschnitzel's "Wiener Dog Nationals." One Race, One Nation, One Wiener!